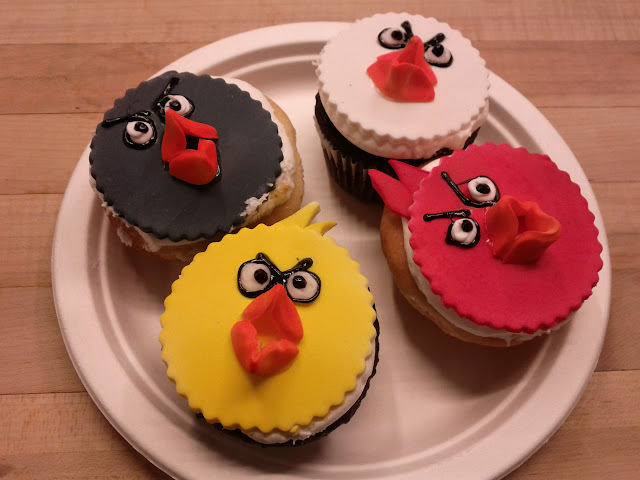 I just spotted a picture of angry bird cupcakes drift past in my Google+ stream. Unfortunately when I clicked on it, it reported the site was over quota. Oh well. So I hopped over to flickr and found you some. 8 cupcakes in an assortment of coloured silicone cups with white icing and green or blue sprinkles. Each cupcake has a fondant ball shaped like an angry bird or green pig atop it. There is one pig with bruises and the mustached pig. They are surrounded by the single big blue angry bird, a bundle of 3 little blue angry birds, the white bomber bird, the black bomb bird, the yellow torpedo bird and the red bird. If you feel like geeking out in the kitchen, there’s even an award winningÂ tutorial. There’s also a few other gamer entries on the instructables competition results page. This entry was posted in Uncategorized and tagged angry birds, cake, games on 2011/07/23 by melissagf.